The new iOS 12.2 software update has been released, we already saw a number of speed tests of the beta versions of the software and now we have some speed test videos for the final version of the software. 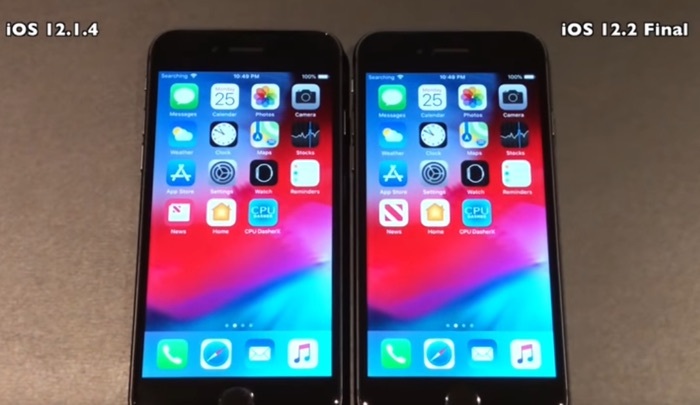 In the videos below we get to see the new iOS 12.2 software run side by side with iOS 12.14 on a range of devices, these include the iPhone 5S, iPhone 6, iPhone 6S, iPhone 7 and iPhone 8, will there be any speed improvements? First up is the iPhone 5S. As we can see from the videos there are no major speed improvements in the boot up time in the latest version of iOS. There are also no major speed improvements in the various apps in the new version of Apple’s mobile OS.